Thank you for your interest in giving to the Elson S. Floyd College of Medicine. We greatly appreciate the support of our generous donors who make it possible for us to educate and support our students, operate the college, develop innovative programs, and serve communities across Washington state and beyond. We welcome you to review the various giving opportunities below to find one that best suits your unique passions and goals for your gift. 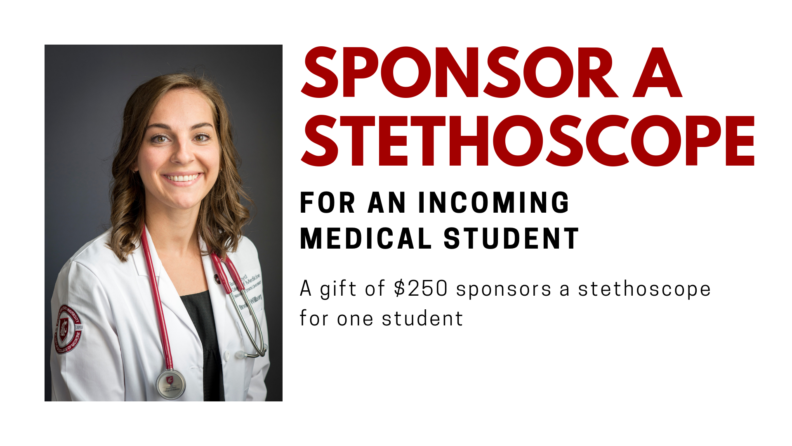 This fund secures stethoscopes for each entering class member at the Elson S. Floyd College of Medicine. The Elson S. Floyd College of Medicine Student Scholarship Fund will help the college recruit talented and qualified students from various backgrounds by alleviating the financial barriers they face as they pursue their education. The Dr. Elson S. Floyd Medical Education Founders Fund provides critical support for accreditation, implementation and operation of the new Elson S. Floyd College of Medicine. The College is thankful for it supporters. The Elson S. Floyd College of Medicine Dean’s Excellence Fund is used at the discretion of the Dean. This fund helps develop innovative programs, recruit faculty and provides the opportunity to support the essential needs in pursuing the mission of the Medical School. The Speech and Hearing Sciences Excellence Fund is used at the discretion of the Chair. The fund supports student scholarships, innovative programs and the recruitment of new faculty to grow and develop the program. The Nutrition and Exercise Physiology Excellence Fund supports student scholarships and financial aid, student travel expenses to attend professional conferences, new equipment and the recruitment and retention of faculty. The Elson S. Floyd College of Medicine Research Excellence Fund is used at the discretion of the Vice Dean of Research. This fund supports research aimed at helping people throughout Washington and the world live healthier, more productive lives. The Elson S. Floyd College of Medicine has launched the 60 for 60 Endowed Scholarship Initiative to ensure all students from the inaugural class receive scholarship assistance. Our goal is to establish 60 news endowed scholarships to support all 60 students in the inaugural class. You can help empower these remarkable students to succeed and build a strong foundation of support to benefit each class that follows. Our students need your support. When you invest in our students, you invest in the future health of our communities. If you would like to contribute to the 60 for 60 Endowed Scholarship Initiative or are interested in other opportunities, please contact Nancy Fike, Senior Director of Development. Couple uses their own medical school paths to provide for future Elson S. Floyd College of Medicine students. Fritz and Julie Clarke’s generous donation helps underwrite the cost of medical school for incoming students.